Losing weight requires you to eat fewer calories than you burn, so it seems logical that eating no calories would lead to the quickest loss. 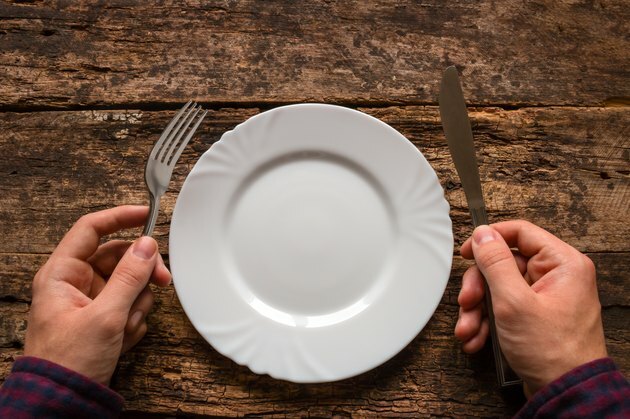 Fasting, however, does not speed up your metabolism -- and may actually backfire by slowing down your metabolic processes to compromise your ability to successfully drop pounds. A moderate calorie deficit is a more healthy and sustainable way to lose weight. Boost your metabolism by eating a healthy, whole-food diet, moving more and strength training to build muscle. When you severely limit calories, your body senses this shortage of fuel and slows down its functioning to conserve energy. Instead of boosting your metabolism, you may experience a suppression of your resting metabolism equal to as much as 20 percent. Your resting metabolism is based on the energy your body uses to fuel basic functions, such as pumping blood and breathing. These activities don't stop, your body just becomes more efficient and burns fewer calories to do them than it would when adequately fed. This is one of the reasons very low-calorie diets and fasts don't often bring about the results you'd expect. Your body is fighting what it perceives as starvation by slowing the rate at which it burns calories. Fasting diminishes your RMR, or resting metabolic rate, because it may have a negative effect on your body composition. Your body may interpret your fast as starvation from a famine. As a result, it starts to use lean muscle for energy and holds onto fat to sustain you during this perceived starvation. Muscle demands more energy, or calories, to maintain than fat. When you lose muscle, your metabolism slows down and so does weight loss. If you stay on a fast long enough, your body may also start to use more than just your biceps for fuel. Fewer than 800 calories a day for a long period of time can wreak havoc on the functioning of your heart muscle, warns the National Institute for Diabetes and Digestive and Kidney Disorders. Your heart may be reduced in size, which subsequently leads to a slowed pulse, erratic rhythms, dangerously low blood pressure and eventual heart failure. Fasting that involves going days on end with just water or juices can be deleterious to your metabolism and health. But intermittent fasting, which involves carefully planned pauses in eating, may help with weight loss. Options for this type of fast might be a daily 14- to 16-hour fast, fasting for 24 hours once or twice per week, or fasting on alternate days. Much of this fasting time occurs as you sleep. Proponents argue that giving your body extended time between meals encourages it to use your fat stores for energy. Research isn't conclusive on the benefits of intermittent fasting, nor has it determined that one pattern of short, controlled fasting is better than another. A 2013 review of intermittent fasting conducted by Brazilian researchers and published in the journal Revista da Associacao Medica Brasileira found that the strategy can decrease inflammation, lower the amount of lipids -- or fat -- in the blood and help with a weight-loss program. Animal studies have shown that intermittent fasting may have a positive effect on blood sugar levels and on the ability to metabolize fat, particularly insidious visceral fat that sits in the belly and increases risk of chronic disease. How intermittent fasting affects human metabolic rates is not clear, however, and more research is necessary. Fasts, whether long-term or intermittent, may sound doable in theory, but in practice, hunger often gets the better of you. When you do break a fast, it's unlikely to be with carrot sticks and plain breast of chicken -- but with something like pizza or cookies. You'll may regain the weight you worked hard to lose, and risk returning to old, unhealthy eating habits that made you gain weight in the first place. Instead of fasting to lose weight quickly, accept a slower process of weight loss and metabolism boosting that keeps the weight off for the long term. Use an online calculator to determine how many calories you need to support your current weight daily, and then subtract 500 to 1,000 calories to estimate the amount you should consume to lose 1 to 2 pounds per week. Do not regularly consume fewer than 1,200 calories as a woman or 1,800 as a man, or you could risk nutritional deficiencies, muscle loss and metabolic slowdown similar to the effects of fasting. Increase your physical activity so you can safely trim these calories from your diet. To truly boost your metabolism during the weight-loss process, make strength training a regular part of your workout routine. This leads to the development of lean muscle, which has a direct effect on the number of calories you burn daily. Do a minimum of two total-body workouts per week that address all the major muscle groups. Use weights that feel heavy by the last couple of efforts in at least one set of eight to 12 repetitions. Increase your weight and number of sets as you feel stronger. Does Juice Fasting Cause Fat Loss?